MoonMarble.com - Glass Eye Studio Paperweight - "Moon"
Art Glass → Glass Paperweights & Decor → Glass Eye Studio Paperweight - "Moon"
This round paperweight contains a white moon with crater pits in the sphere and is encased in clear glass. 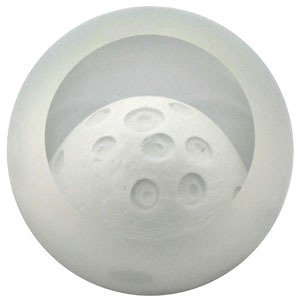 It has two flat sides, one to give it a base and one to create a window looking into the paperweight. Other than the window, the outside of the paperweight is frosted, therefore the focus is solely on looking through the flat window into the piece. This paperweight was handmade by artists at the Glass Eye Studio. It is recycled glass and contains ash from the 1980 Mt. St. Helens eruption. Diameter is approximately 3".